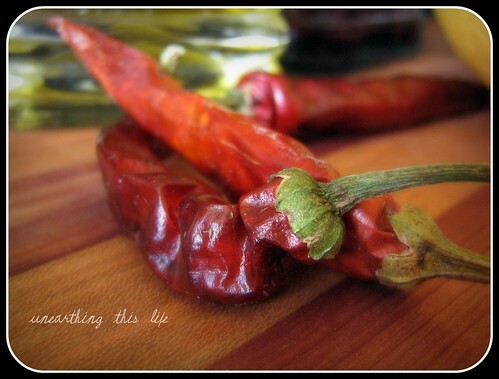 We decided to write today about how we’re all doing for the Real Food Challenge so far. I know it just kicked off a few days ago, but it’s only going for a short month, and we promised Friday wrap-ups, so here goes. ***comment with your wrap-up by Sunday and you’ll be entered to win your very own cheesemaking kit! Since we’ve been so busy, we’ve spent most of the week eating quick meals. I roasted up a batch of potatoes on Sunday night and we ate them in various forms for many meals this week. Sunday night they were topped with eggs poached in tomato sauce. One day they were added to an omelet with some local mushrooms, local raw milk cheese, local onions and some sun dried tomatoes from the garden. I’m really glad local onions are so readily available and so easily stored. We’ve been eating them by the pound, our vegetable of choice for our seasonal eating. They’re not really in season, but since they store well without canning I’m saying they’re seasonal, along with potatoes, which we’ve also been eating a lot of as well. We did end up eating a few things I had frozen that were not seasonal, but they were made from scratch at home. We had empanadas a few days, these are a typical Colombian meal. If you’d like to read more about them see this post. On a positive note, I scored some beautiful mushrooms at the Local Roots Market in Wooster on Saturday, these are going to be baked with a nice venison roast from Mr Chiot’s deer today. I’m thinking this recipe from Jaime Oliver sounds delightful. They’ll also be finding themselves into a few other dishes. This coming week I’m hoping to make up a batch of butternut squash soup and some barley tossed with roasted squash and preserved lemons to blog about. On another positive note, I started my first seeds for my 2010 garden – YEAH! It’s Jennifer from Unearthing This Life here. This past week has flown by. Like Susy, we’ve had an extremely busy week. The weather’s changed on us bringing warmer air and our first thunderstorms of the year. Our portable greenhouse is up, my coldframe remains open, garden beds have been added and expanded and planted, and the incoming chicks are prepared for. I’ve been finding myself daydreaming of tender leaves of lettuce and spinach and lots of fresh spring vegetables. I suppose with all this activity my body is telling me it’s time to stop eating heavy and filling cold weather foods. Because of our busy week, I haven’t had as much time to experiment with as many recipes. I’ve also found this week to be more difficult to stick to our Challenge. I’ve allowed our daughter a few bowls of cereal for breakfast and a prepackaged granola bar. Working outside makes me crave Lipton’s tea, iced with lots of sugar – something I succumbed to once. We’ve all agreed though, that the cracker recipe that Alan supplied completely rocks, and that the tortilla recipe I found will be the only wheat tortillas ever allowed in our house. After Susy’s post about pasta we tried another recipe which went over well. I will be investing in a pasta roller if I continue to make it from scratch. 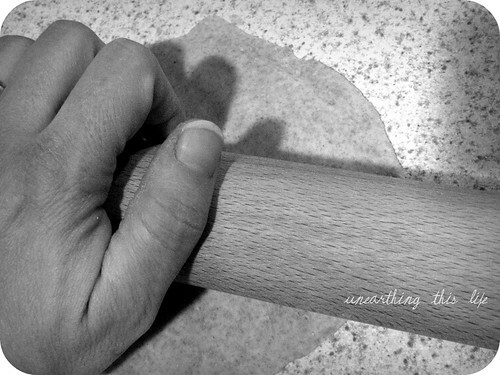 While hand rolling isn’t too difficult if your dough is pliable enough, it is difficult to keep it uniform and can leave some bits more ‘al dente’ than others. I suppose the best results of this past week have been comments made by my Hubby. With the exception of a few spices, he’s enjoyed more of the foods than I think he originally thought he would. Change is scary for us humans! My favorite comment: “Honey, I don’t know if you realize this, but your ‘little challenge’ has reduced our garbage by at least 50 percent.” Fifty percent! By half!!! I also have done far less shopping than normal because it’s much easier to extend fresh foods than a prepackaged, proportioned meal. So, with that I’ll be doing my shopping later today. If you’re interested in my finds come and visit me later! ***Remember to comment with your wrap-up by Sunday and you’ll be entered to win your very own cheesemaking kit! I did a wrap up on my site earlier in the week- so you can read that. Since then I tried the farmer cheese and it was delicious. However, I chose to make it at a really stupid time—as I was starting to get lunch for my overly tired 2 yr-old- so I didn’t get as much cheese as I thought. Maybe 2 cups from the gallon. Perhaps if i hadn’t been so inpatient with the process I could have yielded more. I will be making it again tomorrow so we’ll see! I also made these crackers: http://smittenkitchen.com/2008/12/spelt-everything-crackers/ that I loved! I have tried others but haven’t been able to get them thin enough to get crisp. I am really enjoying the challenge! I’m so glad you tried the cheese! Did you use whole milk or a reduced fat product? I understand that it’s possible to get less cheese from milk with a lower fat content. The spelt crackers are on my list of things to make this week. So glad to hear you’re enjoying the challenge. Have you found any aspects of it that you’re going to stick with? I posted my “weekly report” on my blog earlier today. http://www.debrobertshappycamper.blogspot.com. Made granola for the first time… we love it! Learned how to make yogurt but have not made it yet (need to finish what’s in the fridge first). I made my own pizza crust for the first time last night. We all liked it! I noticed the biggest change at the store with my son this morning…. fewer groceries and fresher groceries. We just go to the produce section and the milk/eggs/cheese section. This challenge is working great for my whole family! So glad to hear the “fewer groceries and fresher groceries”! While we have quite a few staples from previous harvests and purchases, I still find I’m spending less money. How did Agribusiness get us to spend so much?! This week was rainy, humid and cold. I had a sick 10 yr old, a baseball game in the middle of that nastiness and the grand opening of the place I work. Whew. I made yogurt, sandwich bread, and fed my kids their favorite meal, meatloaf LOL. I have to laugh @ how much they love my meatloaf when I despised my own mother’s and my dh hated his mother’s as well. I didn’t make it to the farmer’s market, but I did pick up another two dozen eggs from my new supplier. I love having excess eggs. I made a custard for dessert one night (Lost night, we love to have something special) and I plan to make a yummy looking ice cream custard I discovered in the cookbook recommended here, Fat. I’ll submit the full wrap up on Monday with McLinky. Can I just say, the food photos are gorgeous! So sorry to hear about the illness – hope things are better. Can’t wait to see what you have to say on Monday! Since my larder was fairly stocked, and we seldom eat either packaged food or in restaurants, I didn’t do that much differently this week except to research where, in the heart of a major metro area, I can get local foods without breaking the bank, or needing an extra day. Turns out this is hard to impossible. Because of where we lived, I defined “local” as within a hundred miles for production, but of course I can’t drive a hundred miles for groceries, so I needed to find local retail outlets. Right. I did finally locate a “nearby” poultry farm (if you count 15 miles as nearby when my typical day doesn’t take me any farther than I can walk), but flour turns out to be a huge challenge. I haven’t given up but I’m kind of redefining the challenge for this family as not buying an food in a bag that I can get loose, and not buying anything premade (bread or crackers, for instance) that I can make myself. And in fact, I just made crackers (http://washhands-settable.blogspot.com/2010/03/reinventing-yourself.html), and they’re fantastic, and so easy (but time consuming). Off to the FamilyFarmedExpo tomorrow (.com if you want to check it out) to see if I get any ideas for where to buy local and affordable. I look forward to reading what you learn at the expo! You found the one about my feelings on the local food movement; there are several more as well! Just when I was worrying about what in the world to write about, NDIN cleverly provides me with a topic! I guess it is just busy time for everyone. We have a classes right now and clinics so we are all busy. We have mostly been relying on beans and rice and tortillas. The usual. The granola is keeping everyone going, no pun intended, but other than that they still sneak out for snacks. On a funny note we had a student say the other day that she could not stand the sweet orange fruits with the little black seeds. We all just stared at her, not believing we had actually met our first person who did not like papaya! Didn’t even know the name of it. Amazing! Since fresh fruit is always in season here that is the usual snack around the house. I had an incredibly busy week, a staff member is on vacation and I have had to work some evenings as well as days (cue the violins). So we ate the lasagna and the bean soup that I froze a couple weeks ago. However, we did go out for Chinese food on Wednesday evening, I was just too tired to face making a meal. You truly ARE an inspiration. Stating honestly that it’s a true challenge – and not all goals are always met, you make it much more accessable! Thank you for that. Week number two and breakfast is going really well. Making batch number two of delicious yogurt and made a wonderful bread pudding with raisins cinnamon and nutmeg that I eat for breakfast instead of dessert. Fresh fruits and yummy eggs. I love breakfast and the challenge has broadened my choices. It is wonderful to hear how others are doing and what they are doing too. I am really enjoying the posts and recipes and tips. This past week I started adding grains into our meals. We had Bulgar wheat and also Quinoa. Both good and will use again. I have been eating home made yogurt for breakfast and I make granola bars for my husband to take on his way out the door for work. I also have a source for local eggs, but I will be looking for another source to get organic ones now. I am trying to buy more local things and I think what will be impossible will be bananas. I am checking labels in the markets on the fruit and am trying to buy only “made in the USA” and then organic too. The organic part is the next big switch for us. Over the past 6-12 months with making the change to not buy pre-packages I notice our grocery bills are a lot less and usually only hitting the fresh fruit/veg sections and dairy. Now I am buying local milk but after making butter last week for the first time I find that is WAY too expensive so I will buy organic butter (and try to find a source for that locally too). Right now, still trying to eat through the stock piles of things in the cupboards. And the meat and frozen things too. We are eating local meat 2X a week and once the freezer is empty of store bought things we will only re-stock with local organic meats. 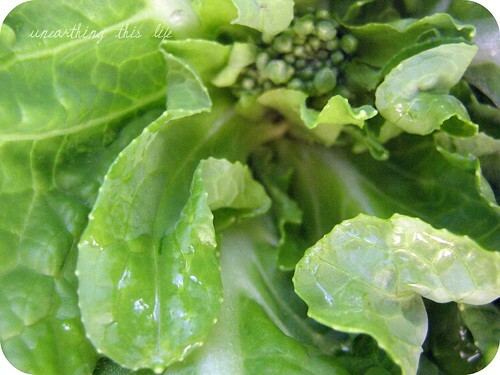 we have been eating greens out of the garden all winter and the spring garden will be in soon. It sounds like I’m not the only one who had a rough week. Whew! Our 9-month-old had been sick, and then, of course, mommy got it too!! Despite everything going on, we still managed to pull off a few things. We started the seeds for our garden — a little late for our area, but still. We potted and started growing herbs on our porch. We decided we don’t want to grow everything and just give it away the way so many folks around us seem to do, so we purchased a book about canning and preserving the harvest. We’ve already figured out there’s a lot of things we buy from the grocery we’ll be able to prepare ourselves. I also figured out a recipe for homemade chicken pot pie, which is not only delicious but will save buying those chocked full of nastiness from the freezer section. I’m determined to tackle granola bars this week!!! Congratulations and good luck to everyone! It was a good week here at Rabbit Hill Farm. I joined my local food co-op and was able to purchase, for the first time; local beef, sausage and eggs. Local meet and eggs had before been a challenge. I made all of our bread and found a great recipe for used-cooked oatmeal. I’ve made cooked oatmeal scones and muffins twice this week. Another nice thing about them is that they have no sugar, they’re sweetened with maple syrup only. The kids and the hubby love them. Tomorrow morning, after church, we’ll be going out to King’s HIll Farm to join their CSA. We’ll be getting all our sumer produce from their organic farm, just a few miles up the road. Finally, I started seeds this week. Tomatoes, cilantro, basil, zucchini, and hot peppers. I’ll be starting more soon. Melissa–can you share the recipe for the oatmeal scones? Sounds great! I’ll be out of town tomorrow and Monday so it will be the last of the week before I can get back to baking, but I WILL meet my challenge. Have a great week! This week I did not bake like I was supposed to, but I did go out and stock up on what I think I’ll need. I picked up gluten, corn meal, masa, and more bread flour. I plan to try a better bread recipe tomorrow and that blueberry lemon muffin recipe sounds delicious! This coming week I will definitely attempt tortillas again and crackers. I got a great radish dip recipe and I need something to eat it on. Besides picking up what I need to bake I also got a canning pot and jars this week and am preparing to attempt some pickles and sauerkraut this week. But the best part of our week (since all else was just preparing…oops) was the trip me and my kids took to a local farm today. We harvested a ton of veggies to take home and ate plenty out in the fields. I will be posting the details by Monday! and I agree with the others, it is wonderful to have the bounty of recipes, knowledge and help that is offered here!! We made our weekly trip to the Farmers Market. Visited a local farm. Made “grain less” fruit cereal and had yummy raw snacks. This week friends kept visiting and bringing food – lots of it home-made from scratch. I didn’t have to cook much because like that all our lunches and dinners were covered. Which was good, since we’re up to our elbows in mud, broken plumbing, grout and (re)paint jobs. I did get to cook Susy’s curried red lentil soup, so easy and yummy: I made lots so had a lot to offer to all those who came in from the rain with their treats for us. And a friend lent me her pasta maker – the real deal from Italy. it’s gorgeous and I can’t wait to make pasta next week. Flour tortillas and bread are also on the list of next week. We also had a difficult week, but not a total loss. Breakfasts and dinners are going well. Lunches need help. I picked up my first “buying club” order and was happy with that. I’ve lost four pounds since starting to axe processed foods! Woot! And I’m getting the garden started as quickly as the weather will allow, which is not very quickly the last couple days. Things are coming along. I have a lot of deadlines circling me at the moment, which is making life difficult. I’m very glad I already have a month under my belt or my poor family would be eating out all week right now. As is, we’re doing pretty well, with room for improvement. We did ok this week. I was out and about more than usual and we get our next CSA share on Tuesday so we were low on veggies my husband will eat. I did have a date with a friend and packed a picnic lunch (she brought fruit from her CSA to share!) to stay within the rules. I cooked up another batch of beans and we’ve eaten most of those. Last week’s granola is gone so another batch is in the cards for tomorrow along with my weekly loaf of bread. Today I made pie for Pi Day (3.14) from scratch — including lemons from a friend’s tree.